RICHLAND -- Stepping into the control room at Energy Northwest's nuclear power plant is like traveling back in time. A labyrinth of powder blue cabinets is embedded with panels of low-tech switches, monitors and gauges evocative of a science fiction movie from decades past. And most of it is original to the plant, which was built in the 1970s and started operating in 1984. "It's 1960s technology," said Bruce Hugo, control room supervisor at the Columbia Generating Station. "It's very reliable. It's almostcomputer virus-proof." There wasn't much activity on those monitors and gauges Tuesday as the plant was in the midst of a two-and-a-half-month shutdown that started April 2 for refueling and biennial maintenance on those three-decade-old systems. Most of them are holding up pretty well, officials said. But a few things are being replaced as part of the $152 million project. "We want to make sure everything is in tip-top shape," said Desiree Wolfgramm, the system engineer in charge of the plant's water system. As part of that goal, the 1,800 additional workers hired for the outage are replacing the main rotor in the generator connected to electricity-producing turbines. The sound of ratchets echoed in the air inside the turbine building as workers crawled in and out of the massive tunnel-like generator to prepare it for the new rotor, a $6 million machine sculpted from one gigantic piece of steel. "This is our money-maker," Wolfgramm said of the generator. "This is how we keep running." Also being replaced at a cost of $113 million is the massive condenser that cools steam produced by nuclear fission in the reactor to convert it back into water, which then is funneled back into the reactor to be turned again into steam. Some of the 350 extra workers hired just for the condenser replacement had to carve a hole through a concrete wall several feet thick to make way for the old condenser, which is being disassembled and will be removed in pieces. The new one then will be brought in before the wall is sealed again. Brad Sawatzke, the plant's chief nuclear officer, said that once installed, the condenser should make the plant produce electricity more efficiently and add an estimated 12 megawatts to its peak output. Another key piece of the outage is the swapping of new uranium fuel bundles for spent fuel that will be cooled in a pond until it can be safely stored in large concrete casks. 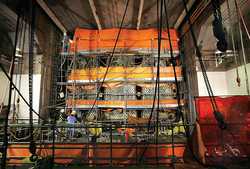 Workers finished replacing 244 spent fuel bundles -- out of a total of 764 in the reactor core -- early Tuesday, but the reactor's head and concrete dome must be replaced, then a set of thick concrete blocks laid on top, before it can be re-started. The reactor is planned to be back online and producing power again by June 15. Throughout April, Energy Northwest officials also have been reviewing the plant's emergency procedures and equipment to ensure it's ready for a disaster on the scale of the earthquake and tsunami that hit Japan in March and damaged the Fukushima Daiichi nuclear power reactors. Sawatzke said since Sept. 11, 2001, American nuclear power plants have had systems in place for what they call a "beyond design basis" event -- essentially a catastrophe not considered by the engineers who originally designed the plant. Sawatzke said the Columbia Generating Station has multiple backup systems in place to keep water pumping into the core and prevent it from overheating in the event of the kind of power loss experienced by Fukushima Daiichi. Those systems include emergency diesel generators, a battery system and portable diesel generator for recharging the battery. If no electricity is available at all, the plant has a steam-driven pump to keep water moving through the core, and a fire truck that can be used either as a water pump or to spray water. The Nuclear Regulatory Commission reviewed the station's procedures and its equipment, and gave the plant a clean report during an exit interview Monday, Sawatzke said. Chernobyl: A Million Casualties EnviroVideo Karl Grossman interviews Janette Sherman, M.D., toxicologist.